I made a batch of homemade tomato sauce yesterday, and tonight we are warming our bellies with a pie plate brimming with Baked Spaghetti a la homemade tomato sauce! Yum! I shopped at Gordon Food Service for a few of the key ingredients. I wanted large cans of tomatoes that were purchasable without a warehouse membership. 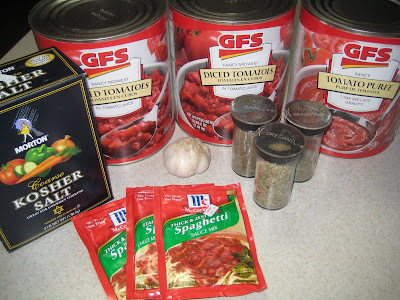 The ingredient list for homemade tomato sauce: Canned tomatoes (I chose diced), canned tomato puree, Kosher salt, garlic (I chose fresh, but you could choose garlic salt and omit the Kosher salt), Basil, Oregano, Italian seasonings and spaghetti sauce seasoning packets (for thickening). 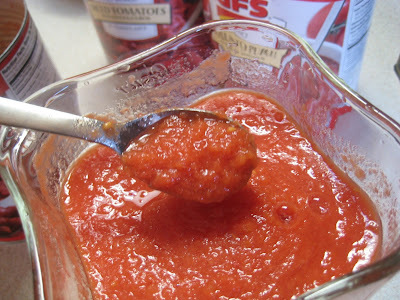 I first opened all of my big cans, and I scooped out just the tomatoes with a slotted spoon. 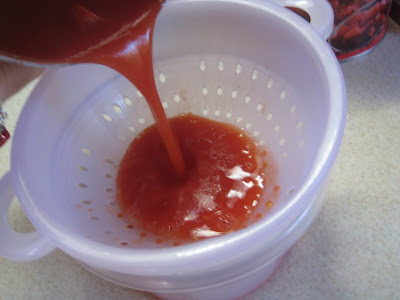 The more tomatoes that I sifted out of the large cans, the more difficult it became to separate the diced tomatoes from the liquid, so I pulled out my favorite little strainer (circa: 1997, my first purchased 'move out on my own' item!) 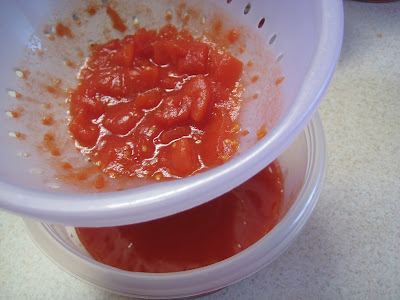 and sifted the remaining tomato pieces. I reserved the juice for later (even though I just wanted to chug it!!!) The remainder was surprisingly about 3 cups of juice! 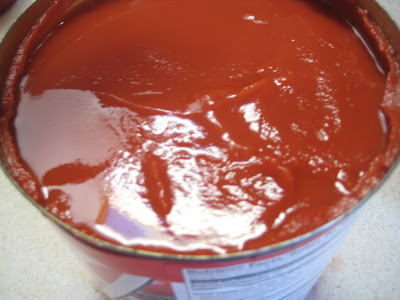 *NOTE: I only added one can's worth of tomato juice into the tomato sauce. I am saving the remainder for another recipe. OK, I far over estimated how much tomato puree I would need, and to add cherry on top (so to speak) I underestimated the size of my stock pot (8 quart).I used 1/3 of the large can (4 cups) of the puree in my sauce. 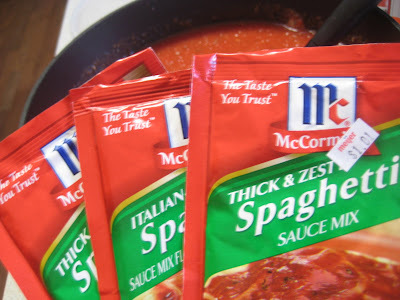 I still think that it was more cost effective to purchase the large can ($4.50) and use 1/3 and freeze the remaining 2/3 for another sauce making day! We are HUGE fans of garlic in our house! One full head of garlic minced was yummy, but next time I may add more... or I may just add more when I add my ground beef or ground turkey to the sauce! Along with the freshly pressed garlic (bottom), I added 1 1/2t. Basil(left), 3t. Oregano (top), and 3t. 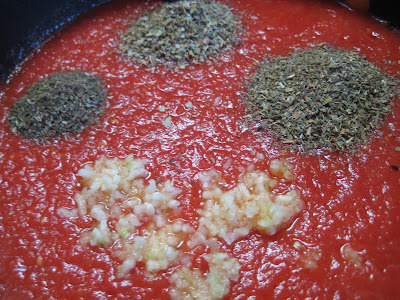 Italian seasonings (right). I also added 2t. of Kosher salt (not in the photo!). Sheepishly, I'll admit that this photo is actually NOT the truth! I added just TWO packets, three seemed excessive, and after taste testing the final product... TWO was the perfecto amount!!! Mix all ingredients well, and it looks beautiful... just like this!!! I wish you catch a whiff of this!!! I simmered the sauce for 3 hours, happily stirring every half hour or so. I must admit, I snitched a couple of spoon-samplings... just to make sure it was STILL yummy! Rest assured, it was! 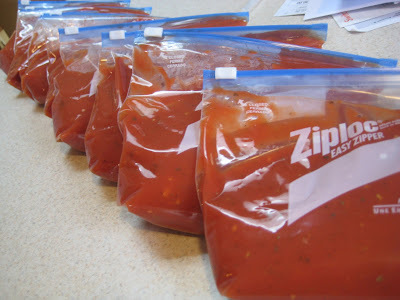 I daringly (since I've experienced Ziploc bag fail) measured out 3 cups (24 ounces since jarred sauce is portioned at 26 ounces/jar) of homemade tomato sauce per Ziploc. I was pleasantly surprised to receive (10) 3 cup portions! I'm looking forward to making hearty pasta dishes like: lasagna, spaghetti, baked spaghetti, and chicken Parmesan. Total: $10.50 for (10) jar size portions. 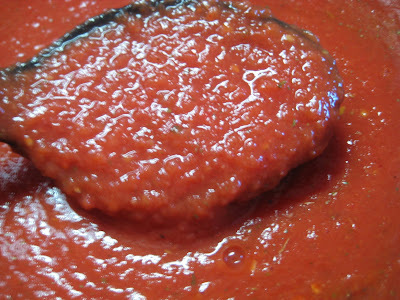 Personal Notes: We make several cold weather dinner dishes that call for tomato sauce. Normally with coupons I can purchase sauce for $1-ish per jar pretty easily. But what I like about the homemade sauce is that it magically seems *special*! The 30 minutes that it took me to prep and package the sauce was time well spent! 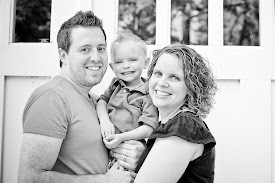 ***Thank you Beth and Patrick for sharing your yummy recipe with our family! Did you readers notice that? Gordon Food Service does not require a membership card. You don't need to be a business or nonprofit either. Families are welcome to shop there, and you can also sign up for a key tag to earn points for a favorite school. I don't shop there often since I'm not cooking in bulk; however, I find that's a good place to get individually packaged snacks in lieu of hitting a vending machine. I just bought big cans of puree from Costco in order to make our own sauce since so much of the jarred sauce is too high in sodium. 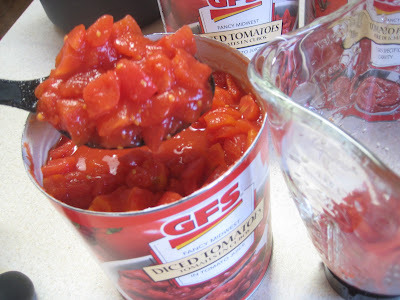 Do you happen to still have the cans of GFS puree & diced? I'm hoping you could post the sodium content/serving? Trying to compare. Hmmm, sorry I don't. I bet that you could call your local store and they could check for you over the phone!!! Immersion blenders work great for this, too, Laura. 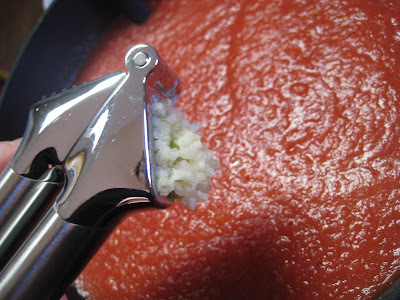 I use my immersion blender when I make my own sauce. (If you don't have one, hint around for one...they're fairly inexpensive.) You've inspired me to make some of my own again, Laura! Even one particular percent drop inside the interest could save those thousands over the use of the loan Payday Loan " this, as outlined by assemblyman mike feuer, who became so skeptical from the cmfa's activity last year which he asked the state auditor to look into it. you in need of some money to have by way of a financially straining time. For more information on water softeners, visit this page for some user feedback and reviews.